Under the firm rule of a military junta for the best part of 50 years, Myanmar and its people have had to contend with the consequences of being a pariah state, both social and economic. Now, aspiring MBA Aye Myat Mon Oo is part of a wave of professionals helping Myanmar’s first democratically-elected government to open up to foreign investment and create new economic opportunities. Already, their efforts have culminated in the lifting of American, Japanese and European sanctions and the creation of the Yangon Stock Exchange (YSX), whose first listed company Aye Myat advised. Though budding professionals in Myanmar enjoy greater opportunities than their forebears, it will be some time before the nation builds up solid educational infrastructure. 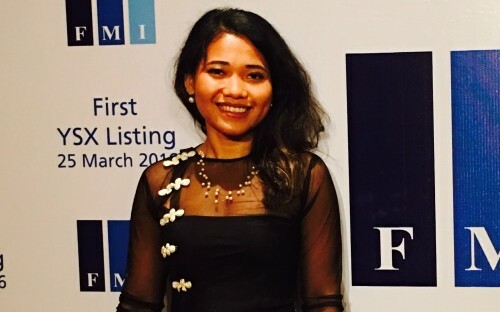 To take her career in finance to the next level, Aye Myat is applying for MBA programs at France's HEC Paris, London Business School and Cass Business School in the UK. What are you looking to gain from an MBA? I’m turning 27 soon and am working as a senior manager at my firm, but I feel as though there is still a lot for me to learn before I can advise my corporate clients as effectively as I want to. I don’t want to change industries, but I do want to build upon the foundations I have already laid with regards to investment and corporate finance. I am expecting that obtaining an MBA will improve my leadership skills, my aptitude for management and decision-making, as well as my international network. I want to continue working in investment banking, either locally or internationally. More specifically, I want to specialize in corporate finance, raising finance and wealth management. What are the most important factors to you in choosing a business school? The financial strength of the country the program is based in is important to me as I’m looking to gather as much financial knowledge and work experience during my program as possible. I also place considerable trust in MBA rankings, particularly with regards to employment statistics. Tuition fees and the availability of scholarships are crucial to my program choice, as there are no government-sponsored lending programs for Myanmar citizens. Finally, the opportunity to study abroad for a semester is extremely desirable. What has been your biggest challenge in the application process so far? Living in Myanmar, it is very difficult to attend information sessions for schools in Europe and also to meet alumni, since so few Myanmar students have taken part in such prestigious programs. Another major challenge for me has been acquiring funding, since there are no lending programs or credit unions in Myanmar catering to students. As a last resort, I will fund my own education. How have you prepared for the GMAT? Here in Myanmar, there are no accredited training schools to help me study for the GMAT, so I have been using official guides, GMAT prep software and YouTube tutorials instead. So far, I have found the official guide to be extremely valuable, and believe that the steps I have taken will be sufficient to achieve the score I want. Even just in preparing for the GMAT, I already have a better idea of how well I would perform over the course of an MBA, and it has helped me polish my mathematical and reasoning skills. Don’t simply choose a prestigious and expensive program! You need to meticulously plan what you want your future career to look like and choose the program most likely to make that happen.